What is Html.ValidationMessageFor in ASP.Net MVC5? Model Property binds the ValidationMessageFor helper method to a model property. Html Attribute allows you to insert CSS. Mostly there are 3 parts of validating a control and displaying a message. Create Rules for model properties in Model class. Displaying an Error message in View. 1. Create Rules for model properties in Model class. 3. Displaying an Error message in View. data-val-required="Name is Required. It cannot be empty"
In this tutorial, I tried to give you a fundamental knowledge about What is and How to Use Html.ValidationMessageFor in ASP.Net MVC 5. 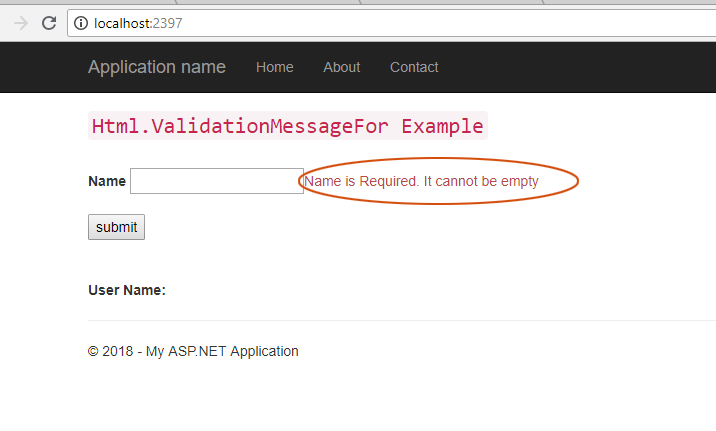 You can learn complete Html Form Validation with an example in ASP.Net MVC 5 here.